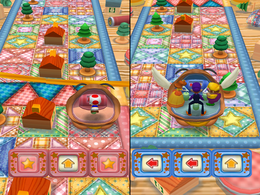 Quilt for Speed is a 1-Vs.-3 minigame from Mario Party 5. Its name is a pun on the term "built for speed". The camera zooms out and the screen splits into two identifying who is on which team, then the minigame begins. Players must pilot their Goomba (or Paragoomba in case of the team) machine to the end of the quilt, using a slot machine with arrows on it. When the player stops the arrow, his or her machine will move in the direction of the arrow. Along the way, there are obstacles such as blocks, plastic toys, and the like that players must go around. The single player has a single arrow that moves his or her machine, while the team has three arrows that the machine takes as directions from left to right. If the path is blocked by an obstacle, or if the players are at the edge of the quilt, the machine will not move. The Goomba or Paragoomba machine ejects the losing team out with it jumping while the winner(s) performs their victory pose(s). Rules – "Guide a vehicle to the finish line. To move, stop the roulette wheel on the direction you need to go." Advice 1 – "Watch the roulette wheel carefully, and stop it on the direction you need to go in order to avoid the obstacles." Advice 2 – "The team of three moves in the order of the roulette wheels, starting from the left." This page was last edited on December 16, 2017, at 07:56.